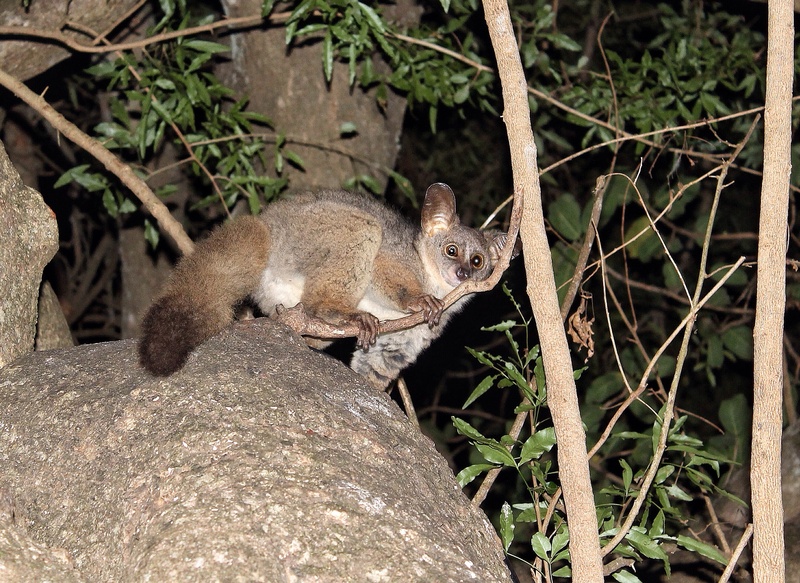 The thick-tailed bushbaby (Otolemur crassicaudatus) is the biggest species of a primitive group of African primates called galagos. They are arboreal, just as their smaller cousins, and walk and run along branches like monkeys. Although they sometimes hop around as if they were kangaroos, they don’t posses the same agility and quick-grabbing reflexes other bushbabies display. Their diet therefore consist mainly of fruit, gum and seeds rather than insects. They are solitary feeders most of the time, but often congregate and socialize on fruiting trees and gum-oozing acacias, even in man-made habitats as plantations and gardens. We were lucky to witness these lovely big-eyed residents of the Bushbaby Lodge near Hluhluwe, eagerly anticipating some slices of banana. After a minute or two they quickly moved into the dark canopy again to continue their usual foraging route. Eye to eye with an ancient ancestor: totally awesome! Had good close-up views of these cuties at Letaba and Punda Maria this past weekend, bit as soon as you point a camera at them they’re gone! Excellent photographs Maurice!